A group of students wander around the large room as they look at a collection of vintage concert posters. A couple of them stop to pick up the headphones hanging from the wall so they can listen to samples of music. These students aren’t in a record shop — they’re in the Mills College Art Museum, viewing the new exhibit, Experiments in the Fault Zone. The exhibit, which opened on Sept 25 and will run until Dec 8, is supported by the Claire Ahern Shaklee Fine Arts Endownment Fung and the Joan Danforth Art Museum Endownment. The exhibit displays pieces from the 1930s to present day, including a collection of photographs of people who have been influential on the performing arts at Mills, such as Marian Van Tuyl and John Cage, who helped develop the modern dance and music programs in the late 1930s. 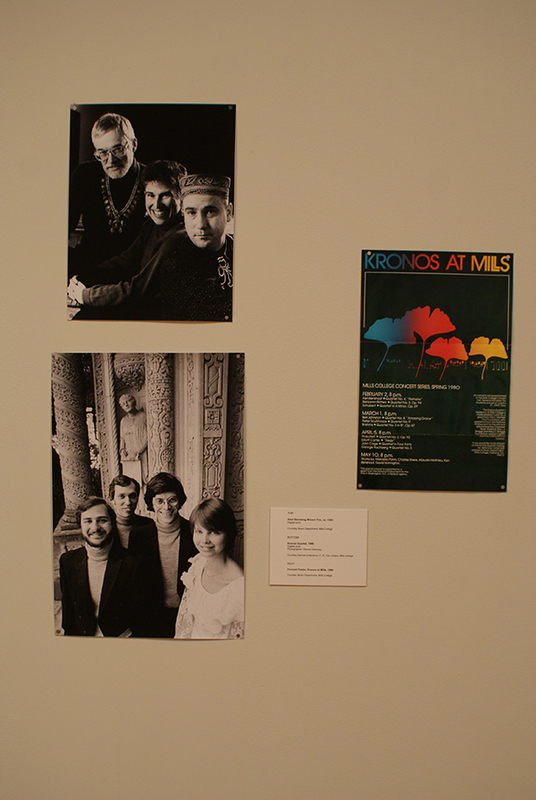 A collection of posters for concerts and performances held at Mills, such as American composer Lou Harrison’s 1982 Shadow Puppet Play, The 1995 Glenn Spearman concert, and the Kronos Quartet at Mills 1980 Concert Series. 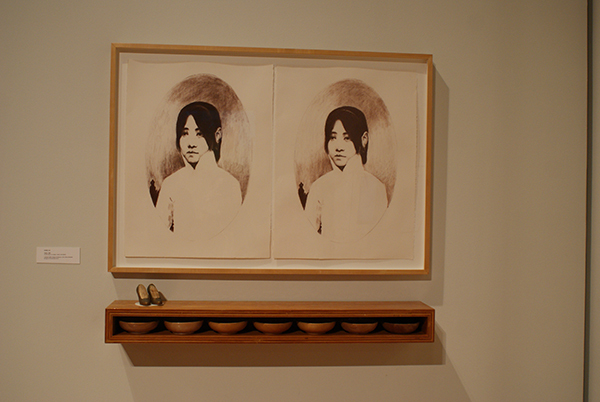 Artwork by Mills Studio Art Professor Hung Liu. “I thought the fact that they still have posters, shows that there is a lot of history with music here,” said Ashley Puente, a first-year student who attended the opening reception. The exhibit also includes other mediums documenting the history of music at Mills. Museum-goers can view a stop-motion animated music video by Samara Halperin, who is a filmmaker and Assistant Professor of Studio Arts and Intermedia Arts at Mills, as well as Eric Marin’s 1986 documentary on Lou Harrison, called “Cherish, Conserve, Consider, Create: A portrait of the American Composer.” Video documentaries of several dance performances are also being shown, including “The Last Dance,” a 2001 performance inspired by Japanese American Internment, which is also accompanied by a display case full of props and choreography notes. The exhibit also includes numerous other photographs of dance and music performances. “I think it’s a really fantastic retrospect of Mills performance arts,” said senior Taylor VanDoorne, who is a gallery assistant at the museum, about the exhibit. Aside from students, other attendees exhibit were impressed as well. 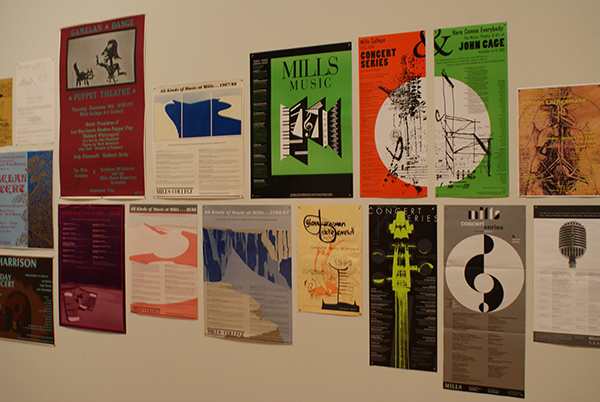 Various posters for past Mills music concerts. For those interested in learning more about performance art history at Mills, the museum will also offer a live music series featuring the work of students and faculty members of the music department during October and November, as well as a presentation of videos, and several lectures about dance and music with Sonya Delwaide, associate professor of dance, and professor of music David Bernstein, among others.